You can add action to an element or a main scene by selecting it and choosing or writing action script in Action tab, which is listed in Properties panel. Invoked when the mouse button is released over an element. Invoked when the user clicks the mouse while the pointer is over an element. Invoked when the mouse is released while the pointer is outside the element after the element is pressed while the pointer is inside the element. Invoked when the pointer moves outside an element area. Invoked when the mouse button is pressed over the element and the pointer then rolls outside the element. Invoked when the user presses and drags the mouse button outside and then over the element. Click the button to clear all the action script defined. Click button to select action from the pop-up list. Check the option to have the scene stopped when entering or exiting the scene. Note: this option is disabled for the element contained in a flip album. Click Goto Scene and it will appear dialog Goto scene. 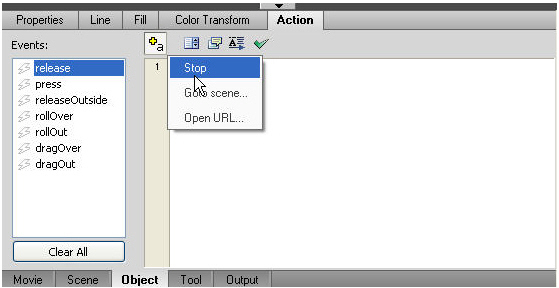 Choose the scene name from the drop down list to make the animation goto that scene when enter or exit the current scene. Click Open URL and it will appear dialog Open URL. Enter the URL like http:/www.sothink.com to make the browser open the website when entering or exiting the scene. Choose the target to specify the target frame where the URL will be opened. You can choose _blank, _self, _parent, or _top, or directly enter the frame name into the Target box. In this field, you can write any action script freely. This displays a list of code you might need to add after the variable or element name. This shows the parameter(s) for the ActionScript you're writing currently. It's useful when you're not sure of the usage of the action or its parameters. Click this button to complete typing automatically. For example, you write use in the actions text box, clicking "Auto Complete Word" will complete the code, useHandCursor. _root.PrevPage() : Go to the previous page. _root.NextPage() : Go to the next page. _root.FirstPage(): Go to the first page. _root.LastPage(): Go to the last page. Click button to check whether there is syntax error in your scripts. The error will show under tab Output. Note: When adding action to a main scene, there are only two options listed: Enter Scene and Exit Scene. Click here to learn the details about adding action to scene.